Fundação Ezute developed, for the Santo Antônio Hydroelectric Plant, Santo Antônio Energia, an unprecedented simulator in Brazil, the result of a research and development project run by the R&D program of the ANEEL (National Electric Energy Agency). 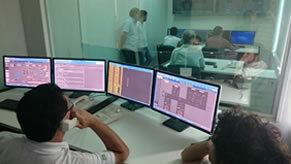 Installed in the Santo Antônio Center of Operational Qualification, in Porto Velho (RO), the simulator is used in the training of operators of the Santo Antônio Hydroelectric Plant, complementing the certification process of the team. With the equipment, it is possible to build a dynamic and immersive virtual environment, enabling the implementation of hydroelectric maneuvers in an environment similar to reality. 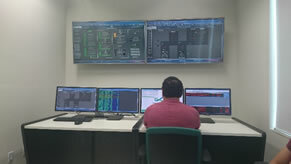 It also allows the simulation of the entire electrical system to which the Santo Antônio Hydroelectric Plant is connected. The simulator presents to the trainee operator scenarios of operational contingencies that essentially may confront the operators in the future. As a result, it is expected to shorten the time it takes for an operator to reach operational maturity. It is an advanced computational system that virtually reproduces the operation of the main and auxiliary equipment of the Santo Antônio Hydroelectric Plant. It is faithful to all the operational characteristics so as to the reproduce for the operator the same graphical interface on the Digital System of Supervision and Control (SDSC) as the one used in the Control Room of the plant.